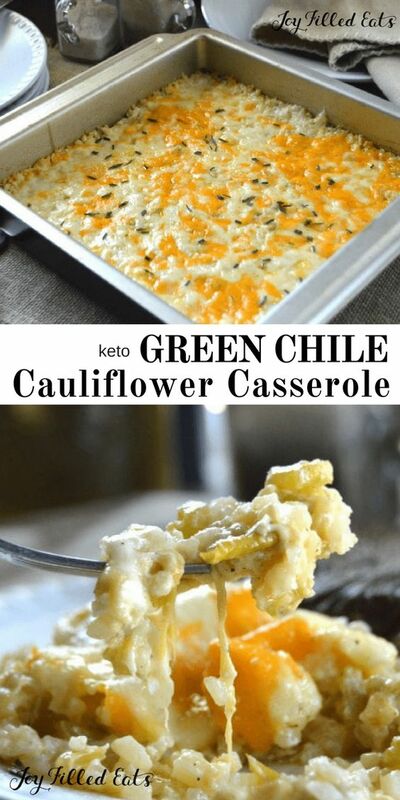 Green Chile Cauliflower Casserole is a low carb remake of an old family favorite. 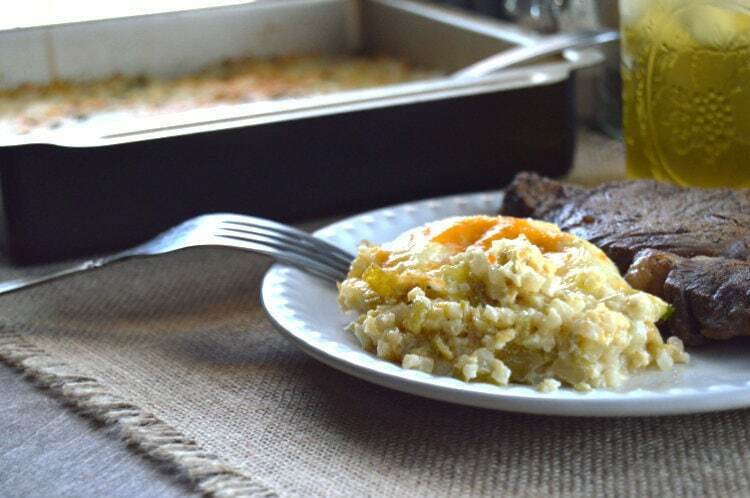 Cauliflower rice baked in a creamy, cheesy sauce studded with green chiles and topped with gooey cheese…it’s Texas comfort food at it’s finest. Quick, easy and great for weekly meal prep! Preheat oven to 325 degrees. Butter or grease an 8x8 pan and set aside. If using frozen cauliflower rice, cook to package directions, usually about 3 minutes. If using fresh cauliflower rice, steam for 3-4 minutes on the stove-top or in the microwave until slightly tender. Take the steamed cauliflower rice and squeeze or press between paper towels to remove the excess moisture and set aside. You want the rice to be fairly dry so your dish isn’t watery! Melt butter in a medium sauté pan over medium high heat. Add celery and onions. Cook for 5-7 minutes or until tender. Turn down heat to medium and add cream to the pan and stir constantly and reduce by half, until thick and creamy and set aside. In a large bowl combine cauliflower rice, ½ cup of each cheese, chiles, sour cream, veggie mixture and seasonings and stir till incorporated. Spread mixture evenly in the prepared pan and top with remaining cheese. Bake at 325 for 20-25 minutes or until bubbly…Enjoy! 0 Response to "GREEN CHILE CAULIFLOWER CASSEROLE – LOW CARB KETO THM"
MUSHROOM & WALNUT SPICY "BOLOGNESE"
Samoa Doughnuts and Doughnut Holes!